If you weren’t one of the VIP’s asked to participate at the seventh annual “VH1 Divas” concert on Sunday, then you won’t be getting an exclusive gift bag with a free NETGEAR MP101 in it. That means you’ll need buy your own… the NETGEAR MP101 Wireless Digital Music Player allows you to listen to MP3 or Windows Media digital music on your stereo. 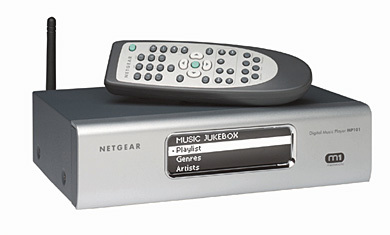 It’s one of the more affordable units available that has a built-in wired and wireless (802.11b/802/11g) network adapter and I believe it’s also one of the first to stream RealNetworks’ Rhapsody Internet jukebox service (comes with a free 30-day free trail). If you try to keep up with people like Patti Labelle, Jessica Simpson, Ashanti, Eve, Tom Jones, Cyndi Lauper, Gladys Knight or Debbie Harry… then you best drop $149 for this player.